In a recent blog post I wrote about identifying claims full of hype in market research. This got me thinking about evolutionary vs. revolutionary changes we’ve seen and how most really fall into the former. Perhaps it’s no surprise given that all market research works to the same end (i.e., gaining new knowledge) by largely the same means (i.e., gathering information from your target audience). First, what is meant by evolution vs. revolution? By evolution, I mean gradually improving what was done before whereas by revolution, I mean disruptive change or a completely new way of doing things. Online qualitative? We’re moving from in person focus groups and interviews to ones done via webcam online. Mobile surveys? Online surveys restructured for a smaller screen and shorter response. DIY research? Same tools, new easier to use package. Most often, evolutionary changes are marked with adapting a current research mode to new technology. In the 90’s and early 2000’s research was transitioning to online. Today we’re seeing the next leap to mobile. 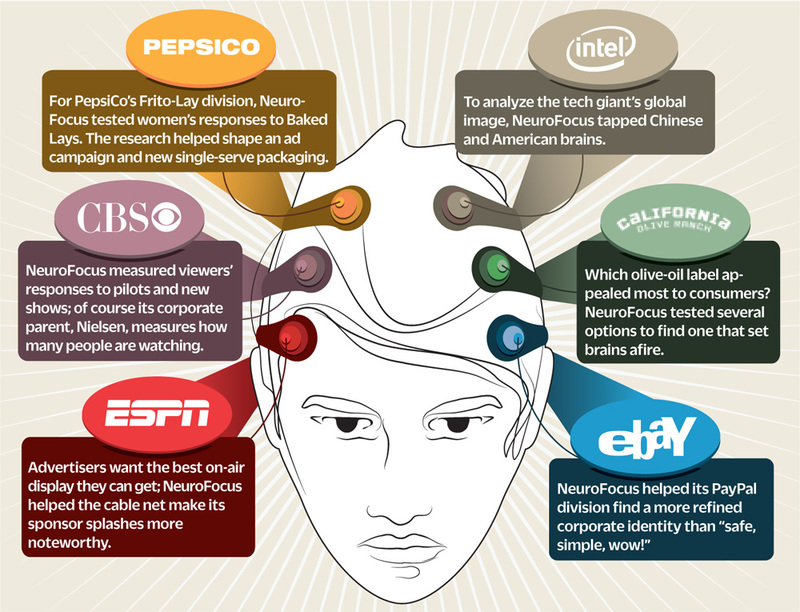 Some companies are already participating neuromarketing efforts. Fast Companies highlighted six of them in recent article. There are of course some changes that have the potential to be revolutionary, depending on how they are used. Neuromarketing can help us gather information at a level respondents generally cannot respond at. Big data – really the ability to collect and analyze it – allows new connections to be found. Online listening and using social media for research could be seen as revolutionary, unless it is only being used to recruit for more traditional forms of market research, such as a survey. Other developments, such as location based surveys could be seen as revolutionary or just an evolution of one of the oldest forms of surveying – the intercept. What do you think? Are you seeing more evolution or revolution in market research? 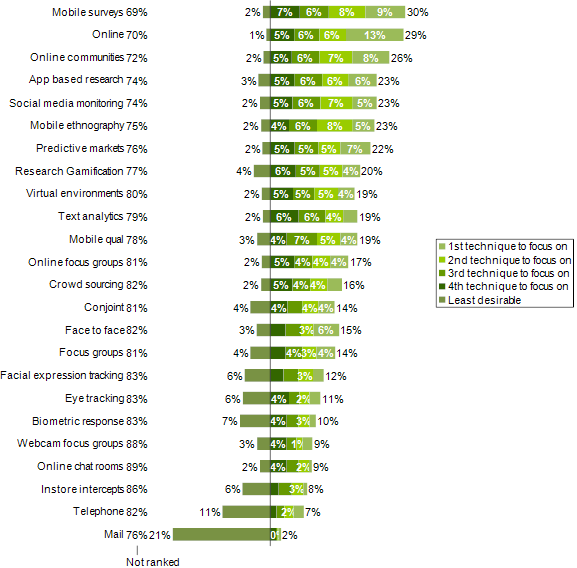 The top part of the graph showing most desirable research techniques – mobile and online – wasn’t surprising. After all, these tools have been the talk of the industry for several years. What surprised me, was not that mail was considered least desirable, but that it was such a strong response. Nearly twice as many people said mail was the least desirable than the second most least desirable, telephone (telephone does have its share of challenges from cell phones to participation rates). Why the hatred of mail? The report, or at least online summary, didn’t go into the why on this particular question. My guess is the longer timeline to field the survey is a major barrier, as well as the additional logistics of conducting the actual mailing, data entry, and so on. Response rates with mail, when done right, can actually be quite good and the costs aren’t always out of line with other research forms. While mail may not be the newest or hippest means out there (ok, it isn’t), mail can still get the job done. As always, it comes down to picking the right tool for the job. For certain populations, small geographies, or other areas where mail excels, it is still a good tool. To be fair, there were many interesting results that I wouldn’t disagree with, and I do enjoy seeing the trends in the report. Sometimes, I just think the mirror lies. On a related note, this made me think of a story on NPR last year. Kevin Kelly, author of What Technology Wants, argues no invention has ever gone extinct (they later found examples that contradict this, but stay with me for a second…), but rather continue to live on to serve some unique niche or as part of a bigger piece of technology. So, until there ceases to be a mail service, mail surveys (and door-to-door, and intercept surveys, and…) will probably continue to live on to serve unique niches in the research world where they excel.